For fast-paced urban dwellers, even shopping for groceries can be burdensome task. Keen to appeal to this demographic, retailers from France to South Korea have devised mobile payment platforms using near-field communication (NFC) technology – whereby shoppers can pay for goods and services with a mere tap of their phone. But while these platforms have been dubbed the future of payments, what will it take for them to enter the mainstream? Boasting extensive NFC commerce networks, Turkey, South Korea, Japan and France lead the pack in implementation of this technology, which enables the bi-directional transfer of data between two NFC-enabled devices that are in close proximity to each other. However, even in these contexts, consumer uptake has been slow – resembling so far a passing craze more than a payments technology that is here to stay. Launching both an NFC payments offering and a branded NFC phone in early 2011, Turkish mobile operator Turkcell was one of the first telcos to break into the NFC market. To ensure scalability, Turkcell has built a sturdy infrastructure of retailers, ATM networks and banks that support NFC payments. By early this year, Turkcell NFC payment platform had attracted over 50,000 active users, with over 300,000 subscribers using NFC-enabled phones. But despite moderate popularity, uptake has been slower than expected, and there is still a lack of NFC awareness – forcing Turkcell to explore other mobile payment alternatives. In South Korea, the formation of the Grand NFC Korea Alliance brought public and private sector players together to accelerate expansion of NFC nationwide. Out of this alliance came the establishment of an NFC shopping zone in one of Seoul’s busiest shopping districts, and a public transportation system where commuters can pay for bus, subway or taxis fares with an NFC-enabled mobile phone. Despite this nationwide campaign, however, consumer interest has thus far been minimal, with only one in ten South Korean NFC phone users having tried the technology, and around 50 percent still unsure what NFC is. Japan has similarly made strides to spur interest in NFC, with over 70 million NFC-enabled handsets in circulation. Early this year, Japanese mobile operator KDDI launched a range of commercial NFC services, from payments and coupons to NFC-based ticketing. In October, leading mobile operator NTT DOCOMO announced a partnership with MasterCard to offer NFC payments in 41 countries. And still, use of this technology has been low, comprising only 15 percent of Japanese handset users and used predominantly for transportation. Recently, France has also risen to the forefront of NFC innovation. Though NFC handsets are less ubiquitous in France than in Japan or South Korea, they still command an impressive amount of the market – reaching a milestone one million handsets sold in less than two years. Across Paris, NFC supermarkets have become a trend this year, with hypermarkets including Leclerc and Carrefour introducing NFC services targeting busy, tech-saavy Parisians. But are consumers aware of these initiatives or interested in using them? 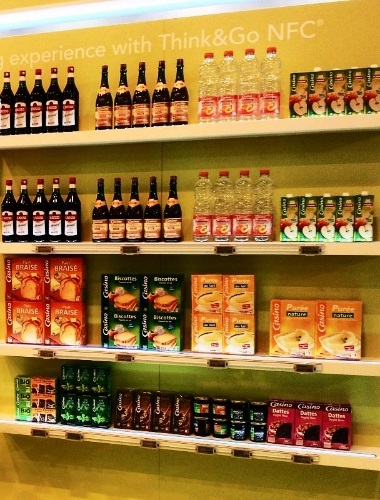 In our next article, we’ll give you an inside look at the French supermarket model, and see how well it works. Beyond these NFC hot-spots, countries including the United States, Poland, the United Kingdom and China have also dabbled in NFC payments, to varying degrees of success. In the UK, NFC payments have become a reality for Orange customers, who teamed up with Barclaycard to introduce “Quick Tap” NFC contactless mobile payments in May. There are limits to this technology, however, as users must have an NFC-enabled phone, an Orange SIM and a Barclay’s bank account in order to make payments. Existing on the fringe of the mobile payment sphere since its emergence in 2004, NFC has become a favorite topic of discussion among industry analysts, but has garnered little interest among its primary target: consumers. With increased investment in NFC globally, and consumers increasingly open to using their phones to pay, what has kept NFC from becoming the go-to payment solution? To a certain extent, it is the limited availability of enabling infrastructure – from NFC-enabled handsets to NFC-accepting point-of-sale (POS) terminals – that has hindered widespread take-off. It is back to the oft-cited chicken-and-egg issue: technology manufacturers and retailers are waiting on consumer demand, while consumers are waiting on more NFC-enabled handsets and POS terminals. The available range of NFC-enabled phones, such as the Samsung Tocco Lite, have also left much to be desired, limiting consumer interest in NFC. However, transactions and active users are slowly increasing with the introduction of NFC on the popular and “aspirational” Samsung Galaxy, according to Ron Carter, Senior Product Manager, Mobile Wallet at Proxama, a UK-based NFC mobile commerce company in a recent interview. Beyond technology, mobile NFC payment stakeholders have struggled to devise commercially-viable business cases for all players involved. With payments already a low-margin business, adding more actors to the value chain (handset manufacturers, mobile operators and industry giants like Google and Isis) can further squeeze margins, decreasing the slice of the pie allotted to each player. For financial institutions accustomed to low margins, adding mobile offerings like NFC payments and mobile financial management can increase the volume of transactions and bring in new clients – boosting the bottom line. Facing competition from mobile operators or big-name mobile payment players like Square or Google, banks may also feel pressure to either introduce equivalent m-payment services or be left behind. Unlike banks, mobile operators have less incentive to enter the mobile payments sphere, as they already operate a high-margin business. However, telcos control the “secure element” in SIM cards, and thus play an essential role in the NFC payments value chain. Charging SIM rental fees to banks and card issuers, mobile operators are able to bring in revenue earned from NFC transactions. With communication and data fees decreasing and subscribers stagnating, adding value through mobile payments (and thus reducing churn) may also be key to operators’ long-term growth, but they will need to realign their profit expectations. Once essential NFC infrastructure is in place and stakeholders have agreed upon a viable business model, the key is communicating the benefits of NFC payments to consumers. The convenience of tap-and-go payments sets NFC apart and gives it the “cool” factor, but how can providers and retailers enhance awareness of this technology? According to Carter, targeted marketing campaigns are essential to spurring consumer interest in NFC: “Demand for payments will be driven by usage of NFC through marketing campaigns where the customer gets an instant reward or incentive.” For instance, retailers might offer a coupon or discount when consumers tap their mobile device to an NFC tag on a poster or point-of-sale display. “By getting consumers used to using the NFC technology, it will be less of a leap of faith to contactless payments,” Carter said. While NFC mobile payment stakeholders struggle to create a viable business model and spur consumer interest, emergent cloud-based mobile payment platforms and other alternatives to NFC (like SMS payments) may be quietly taking the lead. These alternative technologies, from QR-codes to apps like Pay With Square, require less infrastructural investment, are nearly handset-agnostic, and are growing increasingly popular among consumers. However, in contrast to NFC, cloud-based payment solutions often do not meet security standards established by financial institutions such as MasterCard and VISA. This is especially true in the European context where payment solutions must abide by EMV chip-and-pin requirements. While NFC wallets are authenticated by a secure element (chip) on the phone and often require consumers to log into an app using a PIN code, cloud-based payments are authenticated instead with user information held in a (less standardized) remote server. Regardless, security issues have not stopped cloud-based mobile payments from becoming a viable competitor to NFC payments, with large-scale QR or barcode-based pilots launched in both South Korea and the United States (notably, Starbucks). Other cloud-based payment systems have emerged as well, from the audio-based authentication used by Tagattitude to a new UK start-up that uses visual recognition and scanning technology to complete transactions. Ultimately, identifying the “right” mobile payment solution will depend on consumer convenience, not on any specific technology. And there are reasons to be optimistic that NFC may win this battle. Where both consumers and retailers are equipped with NFC technology, the technology can offer a seamless, secure and even “cool” experience. However, other newly-rising mobile payment technologies, while slightly more cumbersome, may capture consumer interest earlier, edging out NFC. One thing is certain – the winner will be determined by consumers, as they vote with their (mobile) wallet for the payment platform that makes most sense amid their busy lives.